"Demonstration of a Boxer's Appetite? " Demonstration of a Boxer's Appetite? 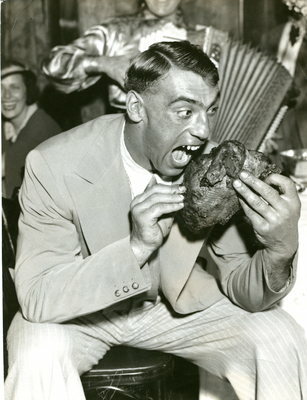 A black and white photograph of an unidentified man about to take a bite out of a whole chicken. The photo, saved by Maine guide Charley Miller, is similar to photographs in the collection of boxer Primo Carnera emphasizing the boxer's large size as compared to average. This photograph, however, doesn't include a caption. This photograph is stamped on the reverse "This Photo Copyright by International News Photos, Inc., 235 East 45th Street, New York, N.Y., syndicating prohibited. This photograph can be used for advertising purposes of for purposes of trade only providing you secure the written permission of the individuals appearing in it. This photograph is sold to you for your use only. It must not be loaned or sold without our consent." No date. In copyright. Restrictions for use stamped on the reverse added to item description.